When it comes to giving Rory an extra special treat, I try to do my best to stay away from that ‘spoiling your pet’ line (something I wander towards a lot if I’m not careful). That’s why I like to combine treats with a challenging toy that will make her exercise her mind just as much as her stomach. The Kong is extremely durable and will stand up to any manner of ferocious chewing, while its odd shape is wonderful for keeping your dog on his or her toes if you choose to play fetch with it. 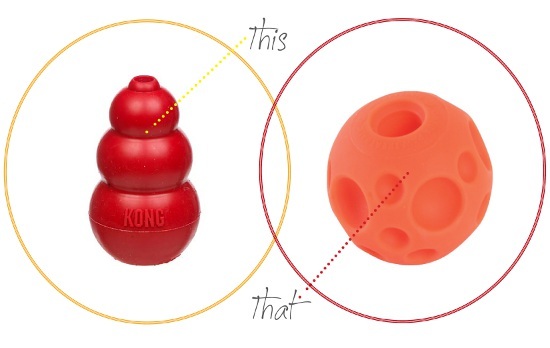 The Kong is particularly great because you can tuck anything inside of it from peanut butter to biscuits and it is easy to clean (bonus!) However, some dogs can ‘master’ the Kong in mere minutes. My father’s Great Pyrenees for example has learned that if she simply squeezes the Kong from either side and throws her head back, the cookie will unwedge and fall out easily. The Treatball is also very durable and can double up as a fun fetch toy too. By placing a handful of dog treats or even kibble inside, your dog is enticed to nose it around on the floor until sweet surprises fall out, thus keeping them entertained for ages. However, the ball is limited in terms of what sorts of treats you can put in it and can also be a little difficult to clean. I adore both of these items and they have kept my little fluffball entertained for hours (which is a great gift if you’re like me and work from home from time to time). So I am curious, which is your favourite? If you could only pick ONE of these great items, which would it be? I pick the kong. I say this because my parents had the treat ball. Their lab loved it. During a visit, Miss Hailey Bug destroyed it within about 15 minutes. She has yet to destroy a large kong!